At lights in upper Kerio Valley, Elgeyo-Marakwet, Kenya, December 2014. Katydids when upon a shrub or tree are virtually invisible due to their great resemblance to the leaves themselves. Note the very long, flagella-like antennae: also known as long-horn grasshoppers as a result. Food is mostly leaves and buds. The specimen shown here is a male and is a capable flier. 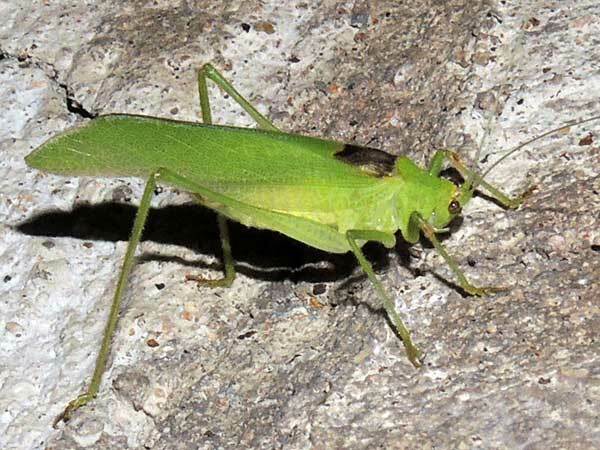 The leaf katydids are more slender and usually have longer wings than true katydids, Pseudophyllinae. Copyright Michael J. Plagens. Page created 12 Oct. 2015.